Bob, be honest, that quote refers to Greenland glaciers, not arctic sea ice extent. I’m talking here about the Arctic region in general, using Greenland as a useful proxy. 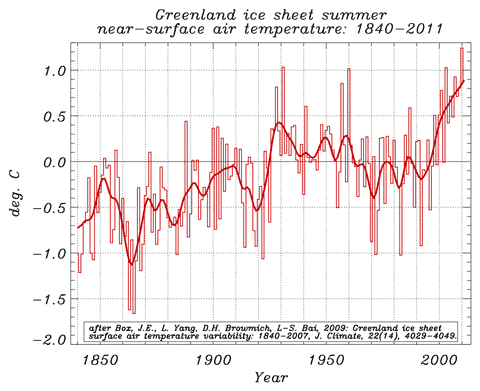 “Greenland was about as warm or warmer in the 1930’s and 40’s, and many of the glaciers were smaller than they are now. This was a period of rapid glacier shrinkage world-wide, followed by at least partial re-expansion during a colder period from the 1950’s to the 1980’s. Of course, we don’t know very much about how the glacier dynamics changed then because we didn’t have satellites to observe it. However, it does suggest that large variations in ice sheet dynamics can occur from natural climate variability. Good grief. Glaciers are not sea ice. Glacier growth is more a function of precipitation at high altitude. The NATURAL PHENOMENON ATTRIBUTION (NAO, AO) is in respect to “The primary conclusion”. By the way, Andrew W, can you spell out what your concerns are regarding the Arctic sea ice extent? I’m just curious, because apart from some general hand-wringing about polar bears, I’d like to know exactly why we should be worried. I mean, I understand the issues regarding ice sheets re sea level, but why the alarm at the sea ice? It floats, and doesn’t affect sea level rise at all. Who cares if a minimum is greater or lower than average? It all re-freezes again in winter. The winter extent just six months ago was one of the highest in the same record. We had people going on a few years back in 2007 about “multi-year ice”, and how “new” ice could never survive season-to-season, etc. The years after 2007 shut them up, of course. A LOT of multi-year ice grew again, completely ignoring the predictions. Now we have the same hand-wringing, but I’d like to know exactly why the panic? Andrew and Simon (echoing Bob to a degree), if there’s no anthropogenic attribution for sea ice extent – what’s the problem? For the first time ever, both the Northwest and the Northeast Passages are free of ice. Shipping companies have been waiting for this moment for years, but they will have to wait a little while longer before they can make use of the Arctic shortcut. Shippers in Bremen are getting impatient. The Beluga Group, a shipping company based in the northern German city, had planned to send a ship through the Northeast Passage — or the Northern Sea Route, as Russians call it — this summer, according to spokeswoman Verena Beckhausen. The route leads from the Russian island Novaya Zemlya, off the northern coast of Siberia, through the Bering Strait between far eastern Russia and Alaska. The ever-thawing Arctic represents a potentially major opportunity for the shipping industry. Currently, there are only between 20 and 30 days a year in which the Northeast Passage is 50 percent covered by ice or less, according to current statistics. But the Arctic Climate Assessment from the year 2005 estimates that such days will become increasingly frequent — with up to 120 largely ice-free days by the end of the century. And that is likely a conservative estimate. As the ice disappears, the previously impossible becomes potentially profitable. Shipping companies are even looking beyond the Northeast Passage to its counterpart along the north coast of the North American continent — the Northwest Passage. why the alarm at the sea ice? It floats, and doesn’t affect sea level rise at all. Who cares if a minimum is greater or lower than average? It all re-freezes again in winter. Congratulations, Bob, you have raised willful ignorance to the status of an art form! Let me give you a clue: reduced ocean albedo -> increased heating -> warming permafrost -> methane emission -> increased heating -> warming permafrost -> methane emission -> increased heating -> warming permafrost -> methane emission -> increased heating -> warming permafrost -> methane emission -> increased heating and so on. Clearly, you and NZCSET deserve each other! Positive feedback on natural variability is still natural variability. * Whence an ‘ice free’ Arctic? * Does an ‘ice free’ Arctic matter? Whence an ‘ice free’ Arctic? ‘Ice free’ is put in quotes, because ‘ice free’ as commonly used doesn’t mean free of ice, as in zero ice. The usual definition of ‘ice free’ Arctic is ice extent below 1 M sq km (current minimum extent is around 3.5 M sq km). This definition is used because it is very difficult to melt the thick ice around the Canadian Archipelago. And the issue of ‘ice free’ in the 21st century is pretty much a non issue if your require this thick ice to disappear. Well, I’m sure there must be some point to that comment. RC2, do you really think your parade of denier sites matters to anyone? Why not throw in some creationist and Flat Earthers into the bargain? Seriously, though, I suggest you read a basic science text, such as “Global Warming for Dummies” before you embarrass yourself any further…. For pete’s sake Richard C, the first thing you offer is data for 6 cherry picked weather station sites. Here’s a map of the globe, you can click on it till your hearts content to get station data from the entire globe, including lots of sites in the Greenland – North Atlantic area, most of which you’ll find far less useful to your cause that the sites you mention. Did any of the “serious skeptics” here watch this video regarding the MWP? It has been posted up thread but the only person who appears to have watched any of it is Andy and his rebuttal to it was pure ad hominen. I think the video raises some interesting points about the provenance of some of the data behind the MWP and I would be interested if someone could provide a more reasoned analysis than Andy’s. Positive feedback has never yet been observed to occur in this way. In fact, we can state quite definitely that it doesn’t happen, because if it could it would have happened in the past, when the temperatures were significantly warmer, and for longer. Besides, I was asking Andrew W, not you. The current Arctic sea ice extent is six standard deviations from the mean, and you are arguing that there is no positive feedback? You’ve just been bitten by a low albedo black swan. The reduced albedo can only have an effect over the next few weeks, until the ice refreezes. Last maximum was almost as high as any in the recent years, so the current minimum was in fact NOT due to reduced albedo. I’ve just been reading what WG1 says on the issue, and they’re significantly less alarmist than you guys. They talk about permafrost melting only near the end of the 21st century, but they make the point that methane has a very short residence time, and the projection under A1B is for a reducing methane concentration after 2050. Abrupt climate changes… are not considered likely to occur in the 21st century, based on currently available model results. Stop getting all worked up over nothing. We saw in 2007 there was a low minimum, yet the next few seasons were quite normal. We know the winds were responsible for that low minimum, and this year too. No positive feedback, no released methane, no runaway warming, or anything even close to that. If you have some evidence that this year’s minimum is due to reduced albedo and positive feedback, please provide it. My arguments were not ad hom, because I didn’t present any arguments. I listened to about 5 seconds of ex-Guardian journalist Peter Hadfield droning on in his irritating nasally voice and decided that I had better things to do with 15 minutes of my life. UPDATE – I did fast forward to a random segment in that video and found a “hockey stick” graph for the southern hemisphere. How is Gergis at al going by the way? but if he is correct, the whole MWP > current temperature argument is a manufactured crock achieved by cynical manipulation of other people’s charts. Presumably his argument requires some kind of faith in the hockey stick and related paleoclimatic reconstructions. No, just some actual diligent science, which is why you are afraid to watch it… what are you going to tell your kids, Andy? “do you really think your parade of [evidence refuting alarmism] matters to anyone? Yes. But not to you obviously because you don’t address any of it. Arctic weather station sites Andrew. I thought that was appropriate given the stream of discussion had meandered to the Arctic. Curiously, those stations don’t exhibit CO2-forced-like characteristics. Did you notice that Andrew? Unless of course, there’s an as yet undisclosed anthropogenic event that occurred in the late nineties to cause the spike. I suspect too that the IPCC methane forcing expression (simplified as it is) is as imprecise as the carbon dioxide forcing expression. And because the initial process that a methane feedback acts on (supposedly as a result of warming) is reducing albedo, that whole positive feedback argument is put on ice (Ha!) over winter. 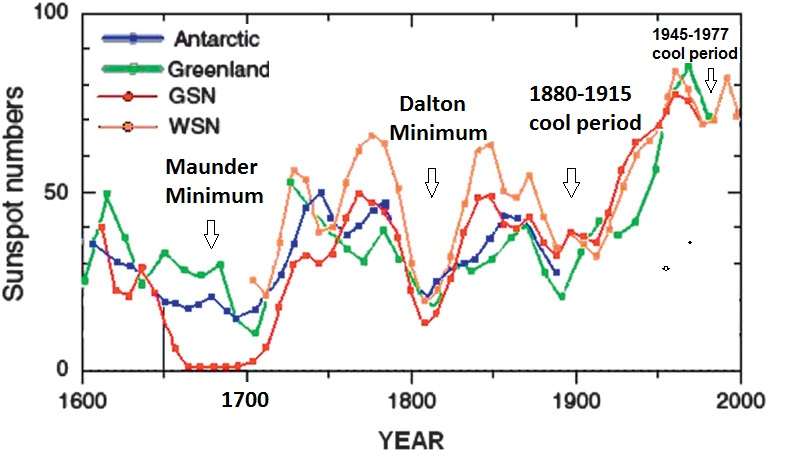 This video claims that the graphs showing a warmer MWP have been “doctored”. The argument for this is that they have removed the instrumental record part of the hockey stick graphs and rely on the proxy data alone. You’ve done a great deal of work here. The scientists that have produced the papers (here and here) do not postulate on whether the previous warming was greater than today or not because you simply cannot tell from the data gathered. You say the temperatures cannot be compared with today’s, so in your comments on each study, which refer to the temperatures being higher or lower than the CWP, how do you know they’re higher or lower? Who defined the MWP as “between AD 950 to 1250″? I missed it. And why might it not have slightly different periods in different places? The site describes how the various definitions of the MWP follow the various authors, so are you correct to claim that CO2 Science “moved” the MWP? If the MWP has different periods in different places, what would the effect on global temperatures be? The current list of NH peer reviewed temperature reconstructions, because the cooler tamperatures would pull downs the NH average while other areas would lift it, the peak would be lower, (lower than the current warm period!) the base more spread. That’s what the reconstructions show, and that’s what “skeptics” argue against! To me that was the end of informed debate on what CO2 Science is doing, and in my opinion, nothing of substance has been added by “sceptics” since then, Andy doesn’t have the foggiest idea what “hide the decine” means, and Richard C thinks the data from 6 cherry picked near Arctic weather sites counts for more than the data from the hundreds of others. I stated this before. Do you disagree with my interpretation? Baloney, I don’t “think” that at all. I’ve merely provided a sample of Arctic stations that don’t exhibit CO2-forced characteristics and since then the Box et al Greenland summer record that doesn’t either. Care to present the “hundreds of others” (individually) that you seem to imply do so Andrew? How about a post called “What would it take”? What would it take for “alarmists” to accept that the IPCC prediction of warming is exaggerated, and that there isn’t going to be major climate change. What would it take for “sceptics” to accept that the IPCC warming predictions are largely accurate, and are going to result in major climate change? 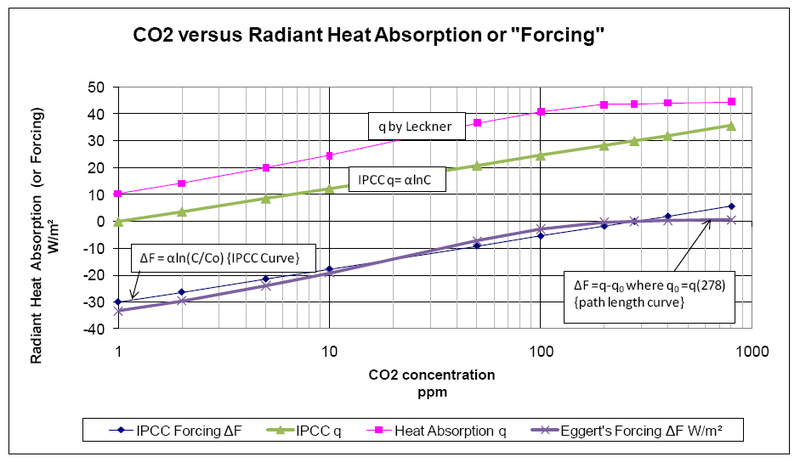 A few “sceptics” replied after a fashion, but not with anything of substance like “ice free actic”, or 20 years of warming despite a quieter Sun, etc. They responded only with waffle. What would it take for “alarmists” to accept that the IPCC prediction of warming is exaggerated, and that there isn’t going to be major climate change? It would take the end of warming for 20 years, and in fact a decline in temperatures by the amount they’ve risen without an explanation consistent with AGW theory as to why no turnaround. barring a climate catastrophe, I think the only thing that would convince “sceptics” they were wrong would be a carbon free energy source as cheap and versatile as fossil fuels, with the supply of this energy not being Government controlled. I say this because I believe the “sceptics” opinions are independent of climate events. I’ve supplied you with the link. Go look. The “decline” does not refer to a “decline in global temperature” – it refers to a decline in tree growth at certain high-latitudes. “Mike’s Nature trick” has nothing to do with “hide the decline”, instead refering to a technique by Michael Mann to plot instrumental temperature along with past reconstructions. The decline in tree-ring growth is openly discussed in papers and IPCC reports. “Hide the decline” has become a slogan for climate skeptics. However, there are several misconceptions concerning this email that give a misleading picture of the science discussed in Phil Jones’ email. When one takes the time to read the email and understand the science discussed, the misconceptions are easily put into proper context. Phil Jones’ email is often cited as evidence of an attempt to “hide the decline in global temperatures”. This claim is patently false and demonstrates ignorance of the science discussed. The decline actually refers to a decline in tree growth at certain high-latitude locations since 1960. Tree-ring growth has been found to match well with temperature and hence tree-rings are used to plot temperature going back hundreds of years. However, tree-rings in some high-latitude locations diverge from modern instrumental temperature records after 1960. This is known as the “divergence problem”. Consequently, tree-ring data in these high-latitude locations are not considered reliable after 1960 and should not be used to represent temperature in recent decades. So I have just pulled a whole article from SkS that backs up my comments about Hide the Decline. Do you still claim that I don’t have a clue? Congratulations on finally using a decent source, if you’d done it earlier you’d have known that the “divergence problem” does not refer to “the apparent decline in temperature records as shown by the proxy reconstructions post 1960” but ONLY to tree ring proxies and since Mann’s ’98 paper the avialable range of proxies other than tree rings has grown to the point that tree rings are no longer required to do paleoclimate reconstructions to high levels of confidence (we now have way better data to work with than Mann did back then, which is why he had no alternative, if he wanted high confidence going back even 600 years other than to rely on the tree ring data and work aroud the divergence problem as best he could with the data then available to him). If you dismiss that as “waffle” then you’re merely arguing from your own authority, in your own little bubble, and there never will be anything that can be said that will sway you. Meanwhile the climate refuses to play IPCC ball. I’m inclined to agree with the commenter who somewhere wondered if the “W” in Andrew W is for “Wriggle”. Houston, we have another problem. So now that you agree I might actually have a clue about the divergence problem, go back and look at the video where Hadfield talks about “doctored graphs” whilst showing a graph that has instrumental data spliced onto the paleoclimatic series. If he wanted to make a stronger case, he wouldn’t have shown the instrumental record grafted onto the paleo series if, as you claim, these are not needed. Furthermore, he shows a SH reconstruction showing a hockey stick. The only one of these that I am aware of is Gergis et al which has been withdrawn, temporarily at least, from publications after statistical errors were pointed out (and acknowledged by the paper’s authors). You can’t intelligently talk about the divergence problem without mentioning that it pertains only to tree ring proxies. I didn’t actually use any source before. I was using my own words. All on the wrong trajectory. If that’s the best that state-of-the-art CO2-forced models can achieve then they’re irrelevant (as are the forcing expressions they employ) and we have to look at other models that do mimic observations e.g. Scafetta’s Empirical Model. So remind me Andrew, when you said I didn’t “have a clue” about the divergence problem, which statement of mine did you specifically have a problem with? you are so far out at sea it’s risible. * March 15, 2013: By this date papers cited by WG1 must be published or accepted. 34 of the latest CMIP5 climate model simulations of global temperature that will be used in the upcoming IPCC AR5 assessment on climate change are now accessible via KNMI Climate Explorer as per the Christy plot. This is exactly what happened in 2007, when weeks of hype was followed by a quiet admission that the root cause of the loss of ice was winds and ocean currents. 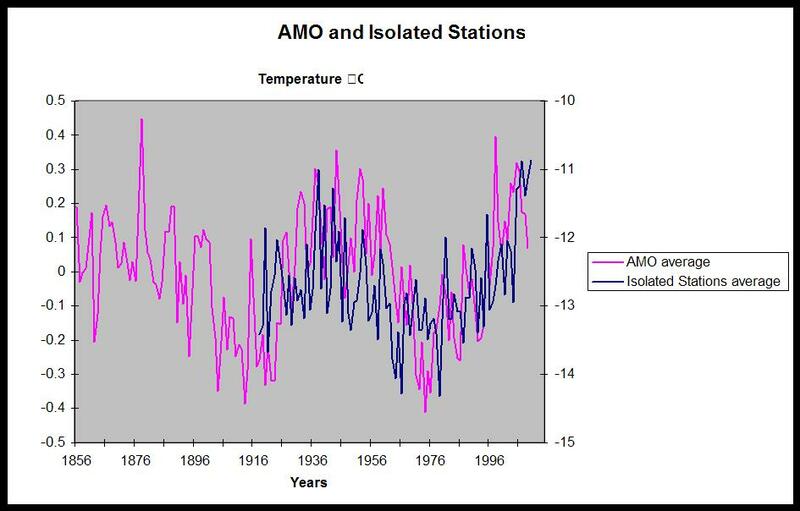 Assuming that the AMO continues with its quasi-cycle of roughly 70 years, the peak of the current warm phase would be expected in c. 2020, or based on its 50–90 year quasi-cycle, between 2000 and 2040 (after peaks in c. 1880 and c. 1950). I suspect I’ve worked it out already, but please tell, what are you waffling on about this time? No, the metadata coordinates are dodgy but looks like Barrow airport is the same for both GISTEMP and NCDC. Search for NCDC BARROW WSO AIRPORT (Wiley Post Will Rogers Memorial Airport) using 71.18, -156.47 returns a point “Unknown Rd” about 15 kms SE of the airport. Search for GISTEMP Barrow/W. Pos (Wiley Post Will Rogers Memorial Airport) using 71.3, -156.8 returns a point in the ocean about 2 kms NW of the airport. Search for Wiley Post Will Rogers Memorial Airport using 71.2856, -156.7661 returns a point next to the airport runway. And going by the Wiki link ‘Periodicity and prediction of AMO shifts’, expect current Arctic temperature conditions to continue until c. 2020. 40 papers but missed the AMO-temperature correlation and cycle. Can you provide attribution for your figure please. Shows a rather good match between model predictions and observed data so I’m trying to figure out how the data you have provided was derived. The RC article is AR4 plotted against land stations, the Christy plot is CMIP5 for AR5 (supersedes AR4 simulations) plotted against UAH and RSS. Christy has since added land series but it doesn’t help the model cause a great deal. Storms of a similar magnitude and timing have occurred 8 times over the 34 year satellite record but none have resulted in sea ice extent as low as it is this year. How does this storm which is unusual but not unprecedented explain the downward trend of sea ice extent over the last 30 years? He has added 4 more models since the EPW testimony, one of which (37, an outlier) looks like it might be on the right trajectory. I’m curious as to which model that is and what they’re doing differently to the rest but 1 out of 38 is not a good ratio of success. BTW, CMIP3 was the AR4 ensemble. It doesn’t. It explains the 2012 extent relative to recent levels and to the 2007 level especially because the same thing happened then. Crippling drought, horrendous floods – you accuse us of approving of these things? And to follow up with something truly insane, you suggest we can prevent them? The bloody weather? Mr Taylor, take a deep breath because your mind has become unhinged from reality. These weather events are not hunky-dory, because a lot of people could be miserable, homeless or dead. Who could approve of them, you twit? But this is Mother Nature. This is God’s will. There’s nothing new here – not for thousands of years. This is life. This is how it goes. We can only adapt. Or at least, the wise ones adapt, and they manage it without crippling each other with guilt over their evil deeds. “I..struck up a conversation with my seat companion, a … pilot [whose] job included training Arab pilots. He [said] they were first-class – but only so long as nothing went wrong. I agree, Andrew, fundamentalism comes in many guises, and is a great way of avoiding individual responsibility for one’s choices in life. …those minority of data sets won’t give a proxy reconstruction of high confidence, especially if the people putting together that reconstruct are seeking data sets that support their preconceptions. The interesting thing about this paper is that is claims to be the first use of Tephrochronology to lake sediments in the area. It does seem quite a stretch to make these statements about temperature reconstructions in Svalbard based on this rather untested concept. If the modern instrumental record has been removed (and the x axis edited to hide the fact) how can these graph say anything about the MWP in comparison with today? As the Real Climate link shows the current temperatures are within the bounds of model uncertainties. Christy’s graphs do not show the model uncertainties so do not tell us anything about how successful the models have been. “this is Mother Nature. This is God’s will” is that really what you believe? I had been conducting these discussions on the assumption everyone accepted that science rather than divine intervention could explain the weather. Please correct me if my assumption is false. Does anyone else here think that any changes in the climate are “Gods will”? It would be helpful to understand the roots of peoples perspective on these issues. Replying to Nick. Do you think that it is an appropriate scientific practice to splice instrumental records onto proxy data in the same graph? Sure Andy, so long as it is labeled as such. Do you think it is OK to remove such data and then modify the x axis hide the fact that the data has been removed?